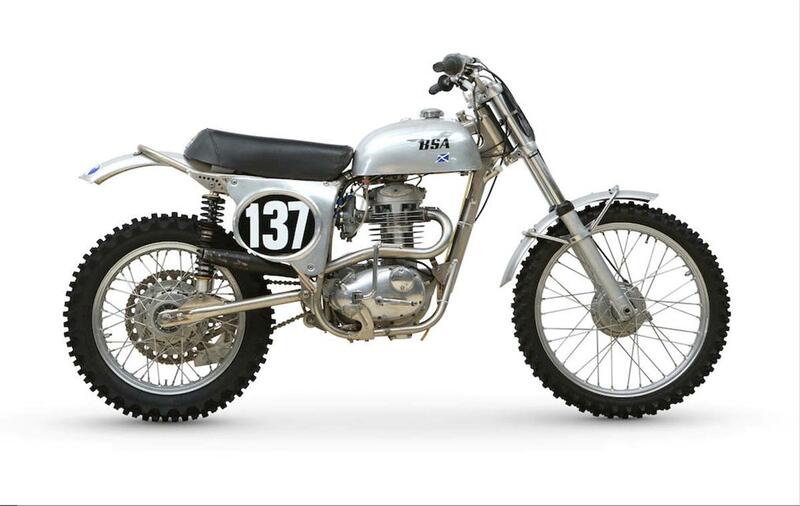 The Cheney BSA Victor 500 used a BSA engine in a Cheney frame to create one of the most effective British moto-crossers of its day. Eric Cheney was a motocross and International Six Day Trials star who turned to frame building when illness forced him to retire from racing. This bike features one of his lightweight designs which carries engine oil in its nickel-plated tubes. This bike comes from the final days of the four-stroke off-road heyday before two-strokes dominated the sport for several decades. "The current vendor purchased this machine from an online auction site. The reprinted advertisement states that this machine is ex-Vic Allan, and that it incorporates several NEB components (crankshaft, cylinder barrel, clutch, gearbox, etc) as well as Interspan twin-plug ignition, Marzocchi front forks, Falcon shock absorbers magnesium hubs, titanium wheel spindles, etc. "However, it should be noted that it has not been possible to verify any of the claims made with regard to this motorcycle's history or specification."